Animal Wildlife | Tiger Shark | The tiger shark is the fourth biggest shark in the world and is found in warmer and tropical waters in the Southern Hemisphere. The tiger shark tends to be found in more coastal waters but tigers sharks are also known to go into the deeper ocean if they need to hunt for food. 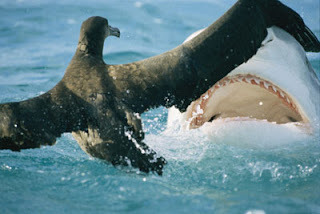 The tiger shark is a fierce predator and tiger sharks hunt everything in the water including fish, seals, birds, turtles and even other sharks. 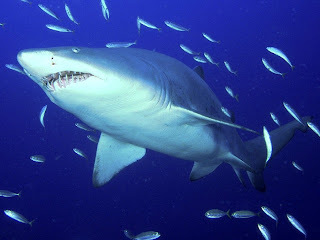 The tiger shark gets it's name from the black stripes it has when it is young. Most tiger sharks lose these stripes as they get older. Like most other species of shark, tiger sharks have sensors on the sides of their heads which enable them to detect small muscle movements from nearby creatures. The tiger shark also has a wedge-shaped head which allows the shark to turn quickly when it needs to. 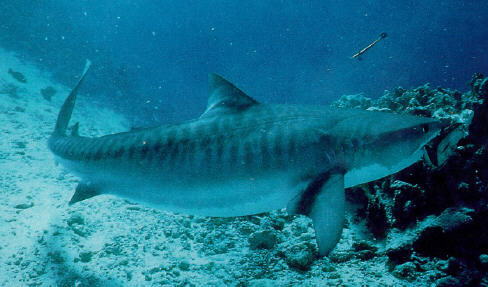 Tiger sharks can reach a top speed of around 20mph which is pretty fast in the water! Tiger sharks are extremely aggressive animals are thought to be one of the most dangerous sharks for humans to come into contact with. Tiger sharks are solitary hunters and usually do most of their hunting at night when the tiger shark can move through the water unseen. 0 Response to "Tiger Shark"